We’ve all been there. 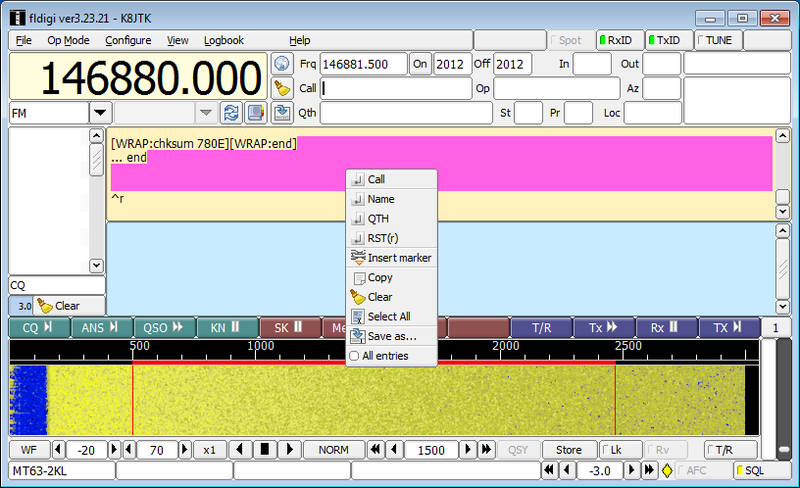 Part of a Flmsg message was missed because the receiving station was off frequency, in the wrong mode, or not paying attention. The issue is corrected and most of the message is received. However, Fldigi doesn’t know what to do with the form because most of the headers are missing – meaning it won’t open in the browser or Flmsg. 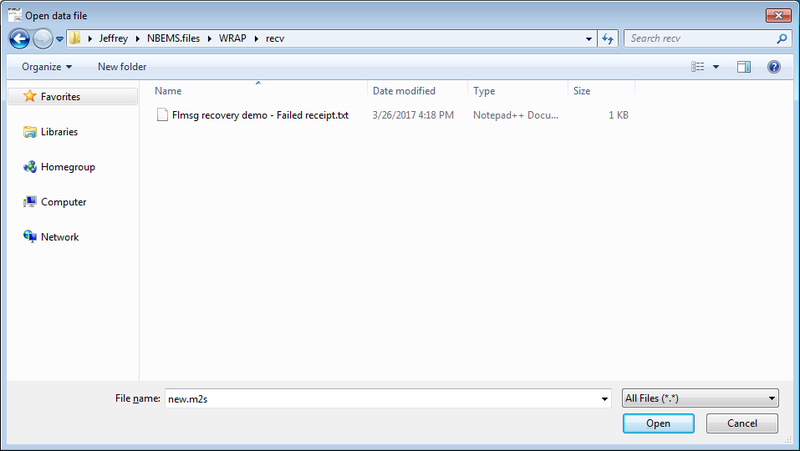 I will demonstrate how I recover Flmsg messages that I’ve partially missed. 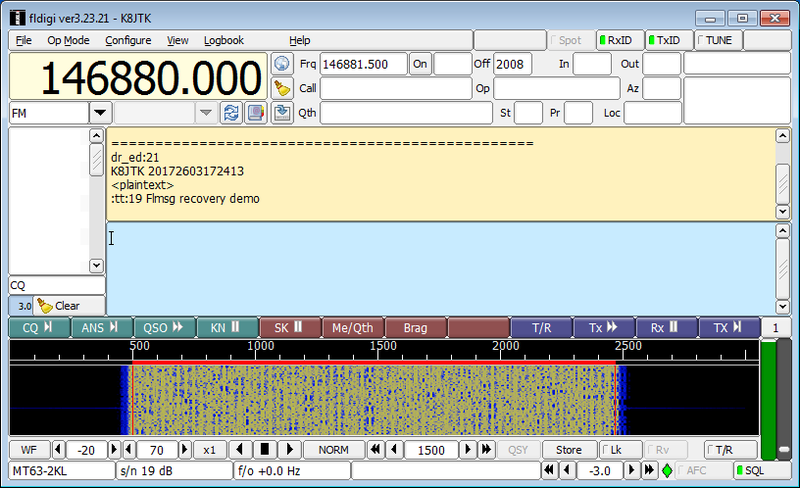 How much of the message can be decoded depends on how long it took to rectify the situation while the other station was transmitting. The sooner, the better. The key is to start decoding the message before the form/message type is transmitted. This is transmitted fairly early on. NOTE: re-transmitting incomplete forms in a real event is NOT acceptable! That is, this (or similar) procedure is used to recover a message, then that message is transmitted in a real event. Ask for a re-transmit, if possible. Check out my other Fldigi and Flmsg posts. faucibus sagittis. Proin a ornare mauris. Maecenas efficitur ante eu mauris tempus congue. Pellentesque at nulla purus. In this message the form type is <plaintext>. Everything before that tag could be missed and the message will still open in Flmsg using this process. In the Fldigi receive pane, part of the message was lost. Note that <plaintext> form type is still received. When the transmission is complete, Fldigi won’t open Flmsg or open the message in the web browser because not all headers were received. Right-click in the receive pane. Click Select All. This will highlight the entire contents of the receive pane. Right-click again and click Copy. 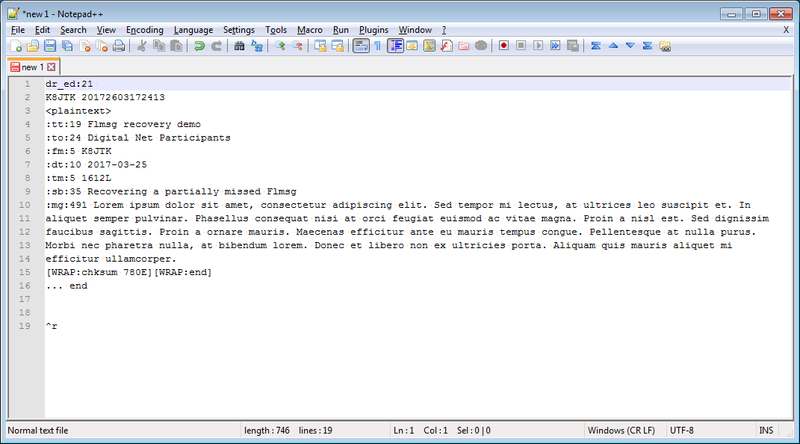 This will copy the entire contents of the receive pane to the clipboard. 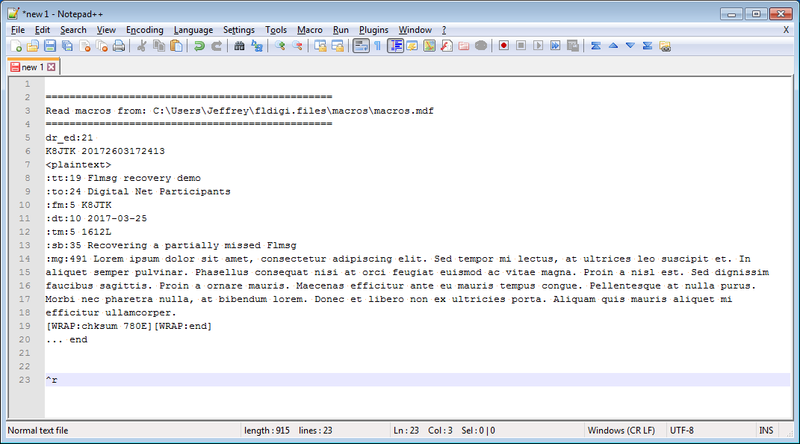 Open a plaintext text editor like Notepad, Notepad++, Vim, or Nano. Do not use Microsoft Word or LibreOffice Writer. 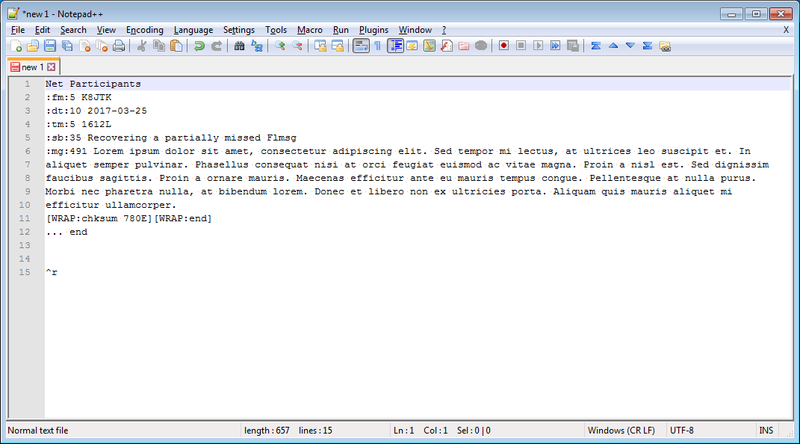 Right-click in the text document and select Paste. Remove any other unnecessary text or other messages that are not part of the intended message. In this case, the lines about ‘reading macros’ are removed. Save the message someplace easy to remember like the Documents folder or Desktop. I’ll put them in the same directory as messages extracted from Fldigi: C:\Users\USERNAME\NBEMS.files\WRAP\recv. 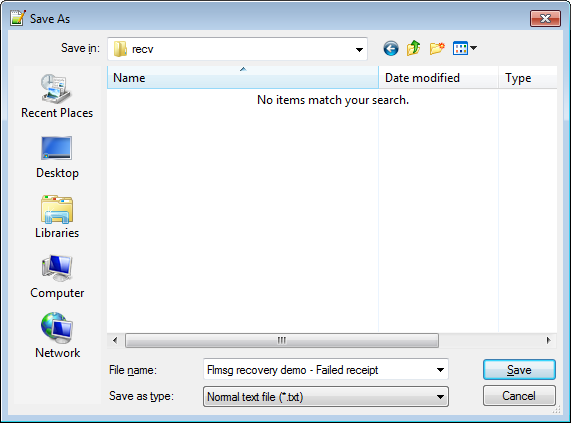 Navigate to the location where the file was saved from the text editor. Next to the file name box, select All Files. 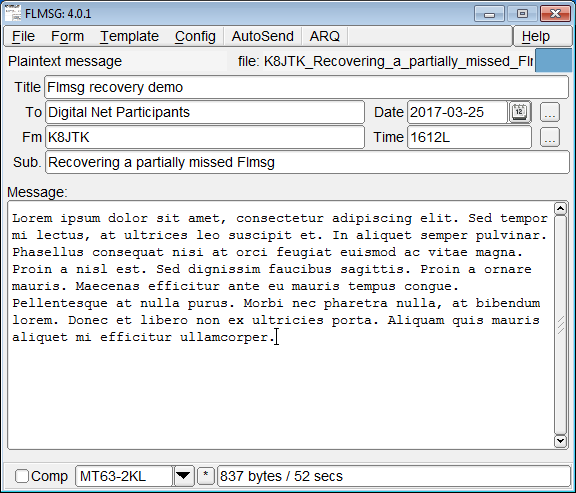 The recovered message is open in Flmsg! 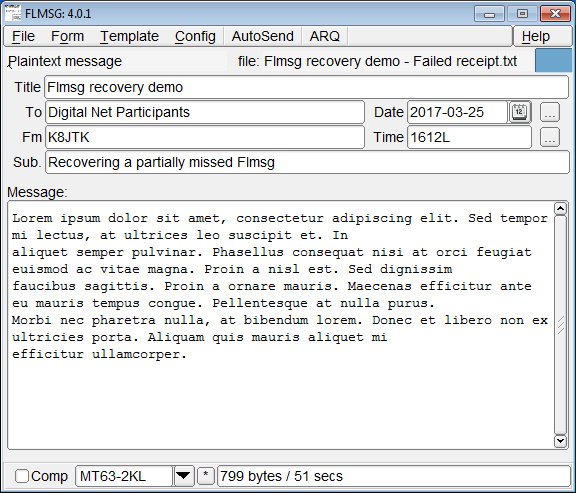 If the form type was missed, a message will indicate an error in the data file (see Failed to Receive Form Type below). 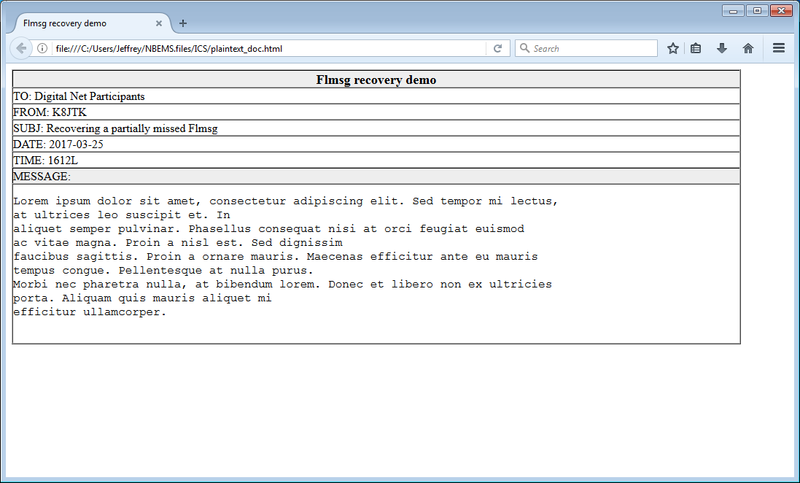 To open the Flmsg form in the browser, in Flmsg click File. 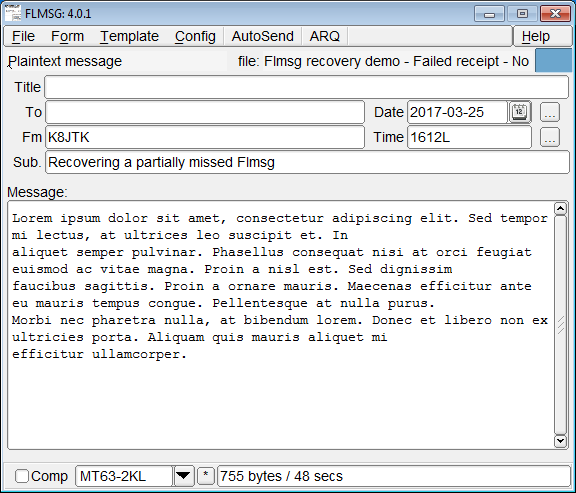 If the message type was not received, there are still ways to recover the message but the form type must be obtained. 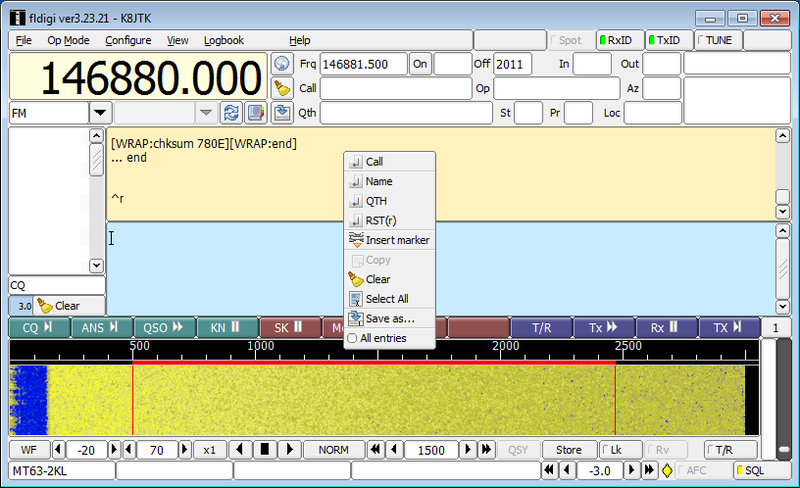 This usually means asking the transmitting station for the form type they sent. 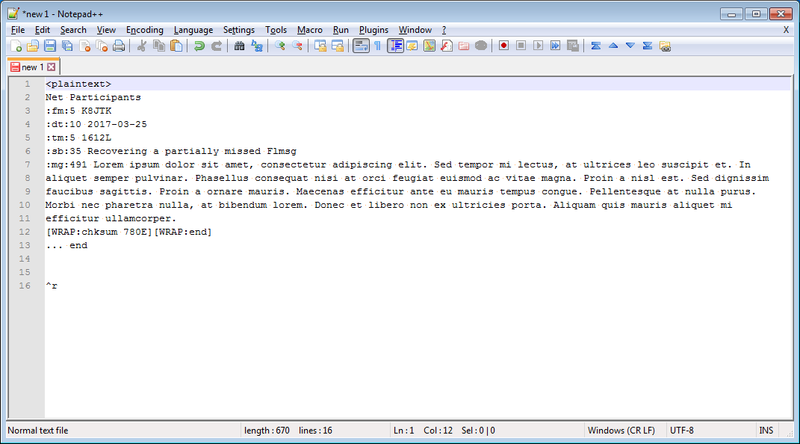 Using our previous message example, paste and clean up the text in the editor as described above. Notice that <plaintext> tag is not seen. Save the message and open in Flmsg as described above. 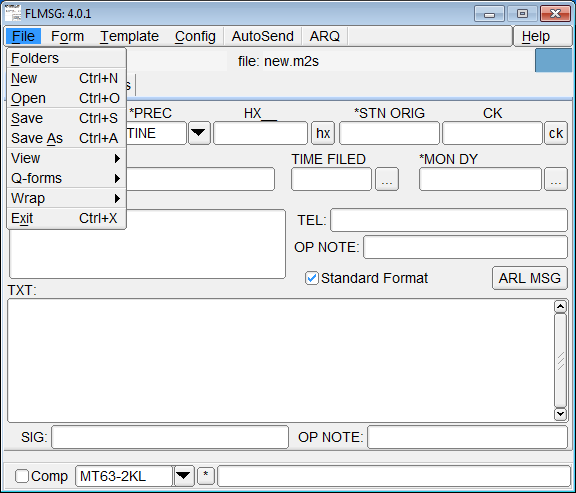 Missing data shows up as blank fields in the Flmsg form – including those parts of the form where the field prefixes are missing (“fm,” “tm,” “sb,” or “mg,” etc.). In the Plaintext form, if the message prefix is missing, since it’s one of the last prefixes transmitted the entire form will appear blank. If the wrong form type is inserted (<plaintext> when it should have been <radiogram>), the file will open in Flmsg but the fields will not be populated. The field prefixes are generally not the same from form-to-form.